Style Crest, Inc. introduces The Carrington Collection, a .046-gauge vinyl siding in two profiles, D4 and DL4.5, with 25 contemporary color choices. The Carrington Collection will transform your home with distinctive elegance, beautiful colors, and the ultimate in protection. Featuring extra rigidity, The Carrington Collection goes on straight and retains its pristine appearance for the lifetime of your home. Style Crest, Inc. introduces The Carrington Collection, a .046-gauge vinyl siding in two profiles, D4 and DL4.5. With the 2018 building and remodeling season in full swing, these two new profiles on a heavier gauge provide contractors more to offer their most selective customers. 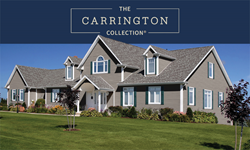 The Carrington Collection is a Premium Vinyl Siding that comes in a wide color palette featuring the latest color trends in the housing industry. Twenty-five colors are available to provide homeowners a choice that brings out the elegance and personality of their homes. Featuring extra rigidity, The Carrington Collection goes on straight and retains its pristine appearance. The exclusive, Double-Staggered, Tuff-Hem™ Nail Hem enhances the stability of the siding and greatly improves attachment strength. These two features offer improved ability to withstand gale force winds and resist sagging and twisting. Superior thickness, .046-guage, provides strength by design, enhancing installation and maintaining straightness for years of beauty. The Carrington Collection siding is durable and is resistant to cracking, warping, swelling and expanding. It will not rot and is weather resistant. Style Crest has been manufacturing building products since 1970 and introduced vinyl siding in 1992, developing product lines for multiple markets and customers big and small. Style Crest’s siding experts are always researching the latest trends, developing new and unique products.